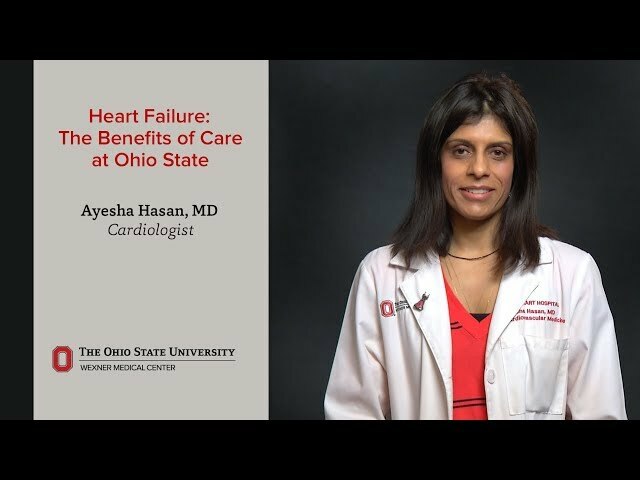 Ayesha Hasan, MD, is medical director of the Cardiac Transplant Program and the director of the Heart Failure Devices Clinic, which focuses on management of nonresponders to cardiac resynchronization therapy. She is an associate professor of clinical medicine and director of the heart failure and transplant fellowship at Ohio State. Dr. Hasan earned her medical degree from West Virginia University in Morgantown, W.Va. She completed her residency in internal medicine and a fellowship in cardiology at West Virginia University, as well as completed a fellowship in heart failure and transplantation at The Ohio State University College of Medicine. Dr. Hasan is an invited lecturer on the local, national and international level, giving presentations on chronic heart failure and cardiac resynchronization therapy. Her articles have been published in peer-reviewed journals. Dr. Hasan has a special interest in device therapy for heart failure, including biventricular pacing, hemodynamic monitoring and ventricular device support. She is also a member of several professional organizations, including the American College of Cardiology and the International Society of Heart and Lung Transplantation. Excellent care provider, very caring. She was very good and professional. Very pleasant - Easy to talk to. Couldn't imagine a better dr. Wonderful! Explained everything! Friendly, professional and very clear with concerns, for this 2nd opinion by my regular heart doctor. While highly professional and data-driven, Dr. Hasan is also empathetic, caring, and clearly committed to my care. I trust her thoroughly. Dr. Hasan always is friendly and very personable. She goes out of her way to provide great healthcare and answer all of my questions. Her staff is great as well. As of 12/20/2018, Dr. Hasan has reported no relationships with companies or entities.